The publication of the society's journal in the year of its foundation was a remarkable achievement. The editor, Chris MacDonagh, and his editorial board had a very limited period to collect material and arrange for its printing by the Derry Journal. With the printing of the 1950 Journal began an association between the Society and the Donegal Democrat Ltd., Ballyshannon, which continued until 1999. 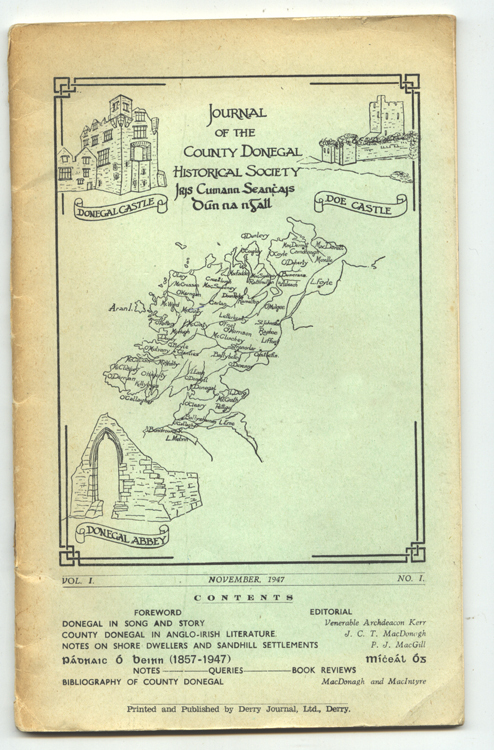 Until 1951 the journal was entitled Journal of the County Donegal Historical Society; from 1951 it became the Donegal Annual. For the first Journal approximately 250 copies were printed; in latter years 1,300 is the usual run. Early annuals are rare and so in great demand. Very few complete sets exist. From a modest beginning the annual has grown in stature, an impressive publication regularly quoted as reference in history studies. It is a vital link with the Society's members and particularly those who are unable to attend its other activities such as lectures and field days. The editor invites articles and reviews from anyone as long as the subject matter relates to the general history, heritage or folklore of the County. Material should be submitted on disk or by e-mail and include references, acknowledgements (see Rules) and a short biography of the author. Photographs, images and maps are welcome.